Most 20-sim models will be built using predefined submodels from a library. You can use the Check for Model Updates command of the Models menu to see if there are updates of these submodels. A window will open, showing you all the predefined library submodels. • Library Paths: This part shows the libraries that are included in the search for predefined submodels. You can select or deselect these libraries. You can add your own libraries in the General Properties window. • Models: This part shows all the submodels of which a match has been found in the libraries. • Model Name: The local name of the submodel. • Status: Shows if the match is older, equal or newer. • Original Filename: Original name of the submodel file. • Original Directory: Original location of the submodel file. • Model Time Stamp: Time when the used model was saved. • Library Time Stamp: Time when the library model was saved. • The Check for Model Updates command will only check the time stamp of a model. If you have changed a submodel, without saving it, the time stamp is not altered. 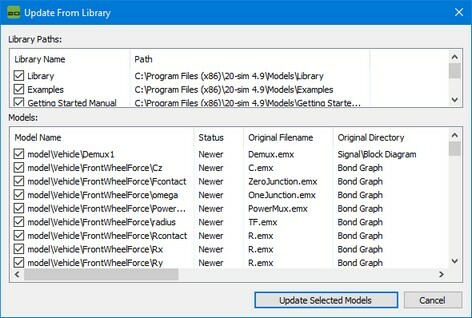 • To prevent models from being included in the updates check, switch off the Allow model updates option of the Model properties. • If you are not sure if a submodel should be changed, open the new library submodel in a separate Editor first.